Vondelpark is Amsterdam’s largest park and is a busy attraction all through the year. On a nice day particularly, it’s a great place to escape and unwind, but even on cold, frosty days you’ll find people enjoying the scenery. There are loads of play areas for kids, and it’s lovely to walk around. It’s also a great place to see some of Amsterdam’s wild bright green Parakeets which began breeding here in the 1970s. 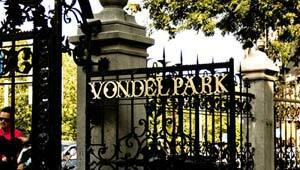 Vondelpark is very linear in shape and although it’s large (47 acres) it’s no where near as big as some of the other notable parks in European cities. It was first opened in 1865. Notable features include the Bandstand which was built in 1873, the iron bridge and the movie theater of the Netherlands Filmmuseum which is inside the attractive Vondelpark pavilion. This is the national film museum and films screened here range from 19th century silent movies to contemporary digital productions. In the summer there are open air films on the terrace and every two years, newly restored films from the collection are shown during the Filmmuseum Biennial. There are several entrances to the park, but we like the path leading from the Stadhouderskade main road, near the Hard Rock Café best because after walking along it, you see the park open out into a lovely mix of waterways and greenery before you. Vondelpark can be accessed by several gateways all around the park, but the main entrance is at Stadhouderskade near Leidesplein and Museumplein.